From a technical standpoint there are two factors that determine the quality of an (uncompressed) audio file. These are the ‘sample rate’ and ‘bit depth’. Common sample rates include 44.1kHz, 48kHZ, 96kHz and 192kHz. For bit depth we will focus on 16 Bit and 24 Bit. In theory the higher value combination of these two factors will produce the highest quality results. The sample rate determines the amount of increments which are recorded to reconstruct a continuous audio signal. For example 44.1kHz means the audio signal gets measured 44,100 times per second. Think of this as lots of tiny periodic ‘snapshots’ with more measurements resulting in a more detailed audio picture. The bit depth (16 Bit or 24 Bit) determines how many different volume measurements the system has to work with. The more different measurements available results in a more detailed waveform and higher quality audio. Each bit represents a significant 6dB in volume. 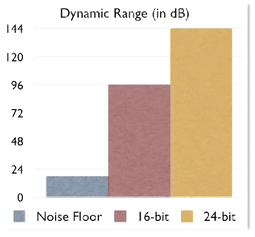 At 16 bit we therefore have a dynamic range of 96dB to work with whereas at 24 bit there 144dB available. In a perfect world 96dB would be sufficient but the reality is that other artifacts such as unwanted low-level noise from your equipment and of course, your actual recording, will interfere with the achieveable dynamic range. At 16 bit this can be a signiicant proportion of the signal that is effectively taken up by this noise. This is called the ‘Noise Floor’. To overcome this the added dynamic range at 24 bit will effectively allow the noise to form a lower proportion of the overall dynanic range without even having to have the signal level too loud (so no need to risk the dangers of clipping!). In summary 16 bit is not workable for recording, mixing or mastering.